Cauliflower parmesan soup! Yum! 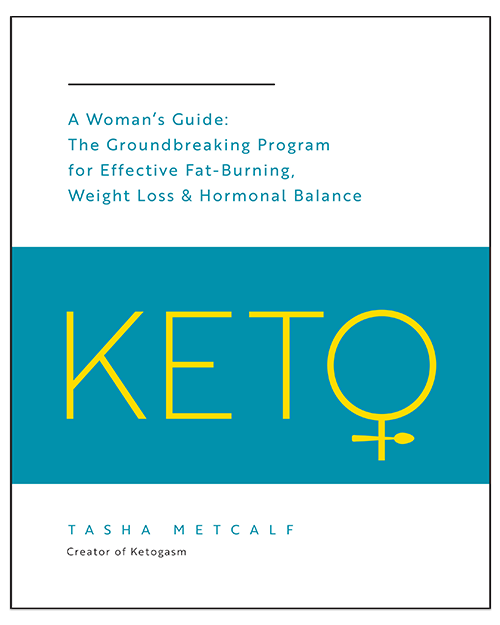 It’s funny; I never considered myself much of a vegetable person before starting the keto diet. But cauliflower? That’s been on my radar since I was a kid. Cauliflower always felt like a special occasion treat. Not necessarily because of the taste, but because of the party platters! Any family get-together or birthday party was sure to feature the classic party platter trifecta: celery, broccoli, and cauliflower. I would run around with olive fingers and demolish the cauliflower tray. Ah, the simple life. There’s just something about the veggie that makes me feel nostalgic. Although I loved cauliflower, my consumption was limited to party trays with dip. 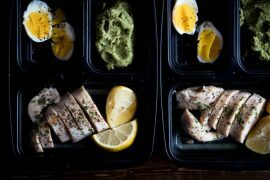 Imagine my surprise when I discovered the innovative ways to incorporate cauliflower into your low carb diet. 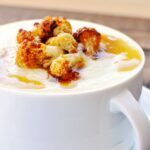 Cauliflower has since become a staple in my diet, and I’ve become particularly fond of making cauliflower soups. How to make soup creamy without cream? 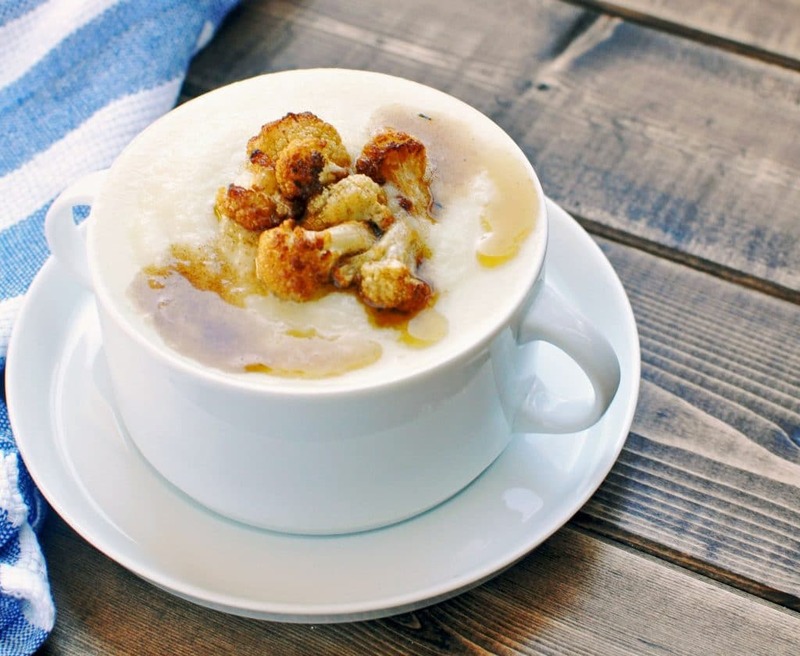 This creamy cauliflower parmesan soup is velvety and rich. It’s amazing how creamy the soup turns out considering there is no cream whatsoever. The trick to a creamy cauliflower soup without cream is adding in butter, or ghee if you’re dairy-free, and using a blender to puree. You can use either a stand blender or immersion blender, what is most convenient for you. Voila! 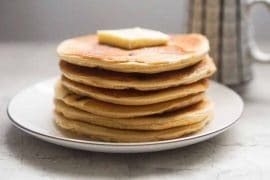 Creamy without the cream and added calories! Reserving small cauliflower florets and cooking them in herbed brown butter add an additional layer of texture and flavor (a tip I picked up from America’s Test Kitchen – I just love that show!). 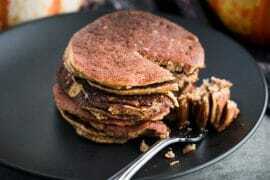 Healthy and decadent! Whaaat?! 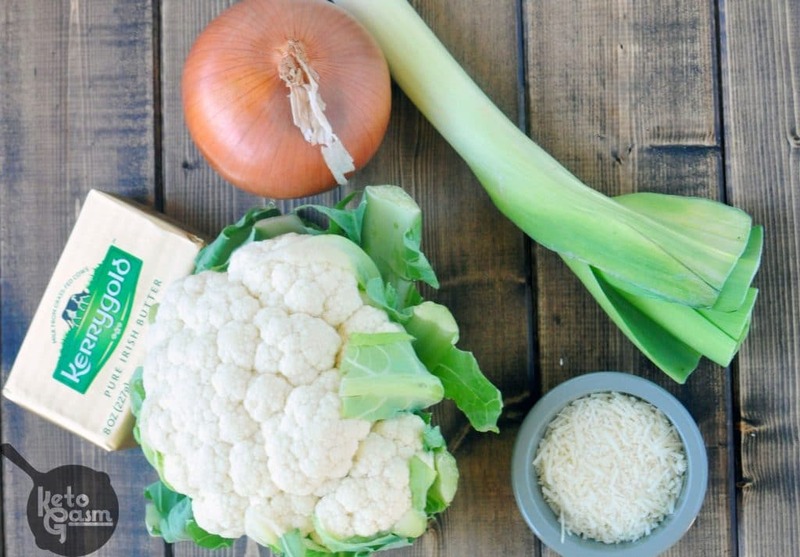 You will need cauliflower, Parmesan, butter, leek, onion, thyme, salt, and pepper. 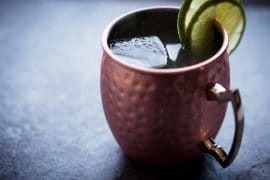 I enjoy using bone broth or stock to simmer the cauliflower, but you can easily use water or vegetable stock for the fluid if you are vegetarian with equally delicious results. The leek and onion are sautéed in butter and salt, cauliflower is added with the broth/water and simmered until tender. Meanwhile, your florets are cooking in melted butter and thyme. Just blend the cauliflower mixture with parmesan, then garnish with golden florets and browned butter drizzled over the top. It’s easy, looks fancy and tastes much more sophisticated than anything you’ll find on a vegetable party platter! 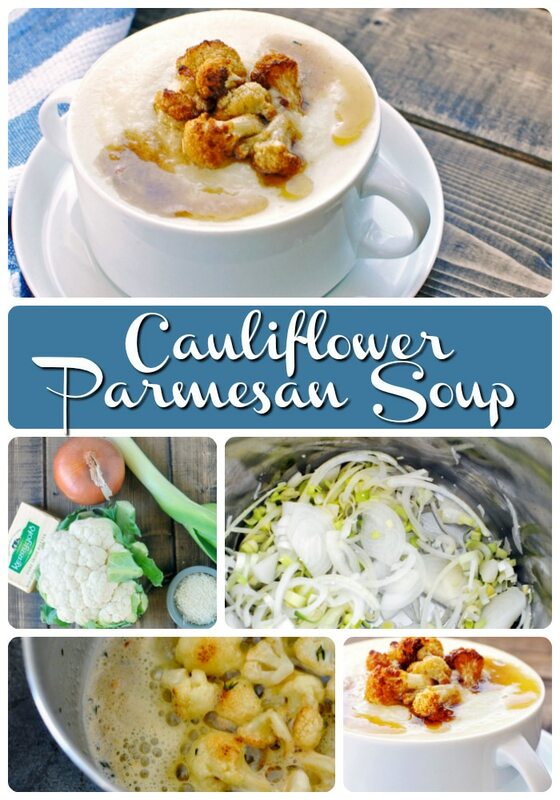 Try the cauliflower parmesan soup when you’re in the mood for something warm and hearty. If you’re looking for more recipes using this creamy cauliflower base, check out my dairy-free keto clam chowder! 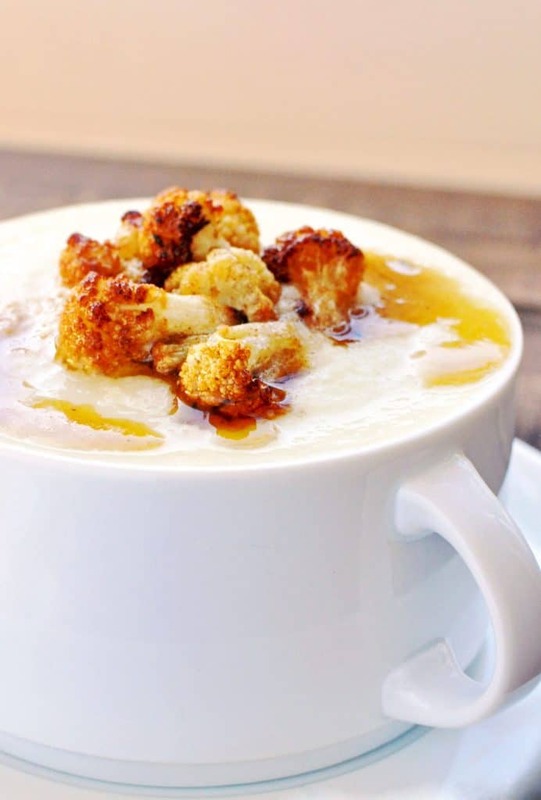 A decadent, creamy cauliflower soup without any cream at all! Melt 2 tablespoons butter in large pot. 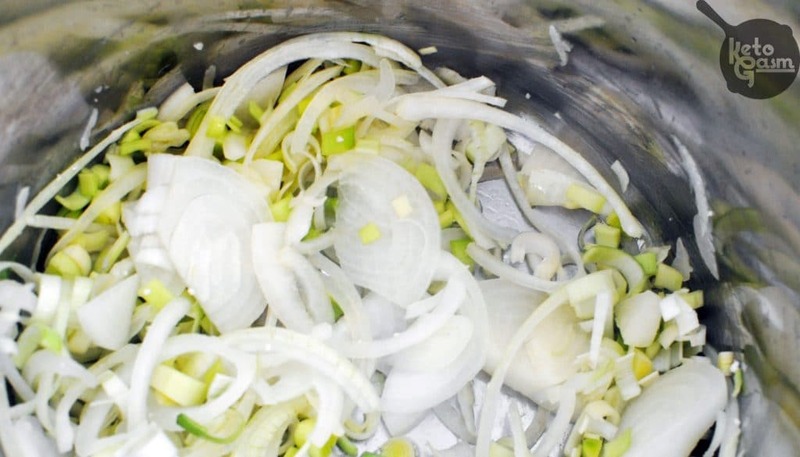 Add salt, onion, and leek. Cook until onion becomes soft and translucent. Add half of cauliflower, 4 tablespoons butter, 2 cups broth and 2 cups water to pot. Bring to simmer for 10-15 minutes, until cauliflower is tender and falling apart. Add 3/4 of remaining cauliflower to pot and continue to simmer. Melt 2 tablespoons butter with thyme and remaining cauliflower florets. Stir as the butter begins to bubble and brown. Once the cauliflower in the pot is tender, remove from heat and place in blender. Add parmesan cheese. Being careful to cover blender vent with towel, blend simmered cauliflower mixture until smooth. Add additional water to adjust consistency of soup if needed. Blend some more. Transfer blended soup to bowl. Garnish with golden florets and drizzled brown butter. For a dairy-free version, omit Parmesan and replace butter with ghee. I have 2 questions to ask. 1. Do you use the whole thing or just the florets for the soup? 2. Is there some reason you add the cauliflower in two batches? Oh my! Seriously some of the best soup I have ever had. I don’t usually like leftovers but this soup…so good!! Thank you for the amazing recipe. Where’s the Parmesan info? How much and when to add? 1 cup! Apologies, I imported all my recipes into a new plugin last week and had to correct some things that didn’t merge properly. I totally missed this, thank you for the heads up! Did I miss how much Parmesan cheese to add and when to add it? This looks great. 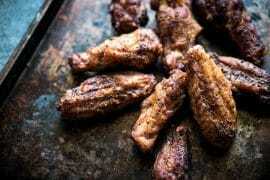 Do you think it is possible to make this in a slow cooker? Great soup! My husband loved it. I added some grated smoked gouda cheese! Loved the soup, the buttered cauliflower was almost like croutons. Tasted even better the next day. Now just to master a cloud bread recipe and I’ll try that with it next time! Just made this, delicious! Thanks! I made this tonight for my family. They loved it! I made a few variations. I added diced bacon, saute’d the leek and onion in the bacon grease, then blended it with some chicken broth. I saute’d all of the cauliflower in butter. I added shredded chicken. So good! Thanks for the recipe! I also added cream! Can you add that to my original comment? 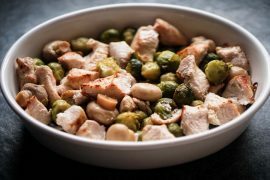 What is the serving size (to calculate calories)?